Grundig Eton FR250 AM/FM/Shortwave radio. This little gem is powered by three 'AA' cells, 5VDC plug-in, or cordless telephone handset battery pack charged by dynamo (hand powered generator). I think the highlight is the generator part. The hand crank comes out of the side of the box. The shortwave part covers about 5-18MHz in seven bands. Here you go, it's got the usual AM and FM reception. It's got shortwave reception devided into seven bands. There's a fine tune knob superimposed on the main tuneing knob. A nice feature. It's very usable and reasonably precise. The red line on the face does not acurately match the frequencies printed on the face plate. On mine, I get 10MHz when the dial goes past 10.05. The same problem happens with AM and FM. 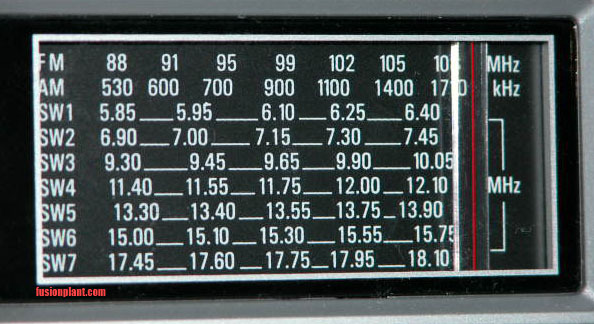 For example, to get 101.9MHz, the dial has to go just past 102MHz. The size of the unit is very decent. 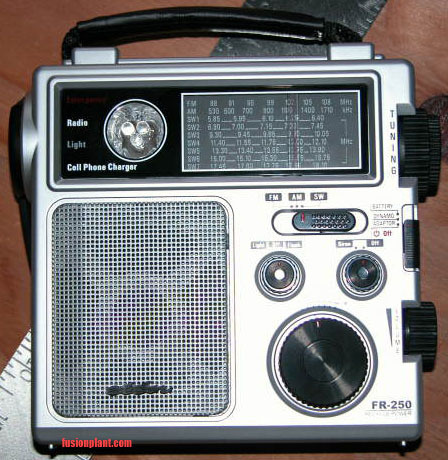 It's much smaller than the impractially large C Crane Freeplay radio. It measures about 7 inches square and about 2.5 inches thick. This unit is practical for use in a car, home, or outdoors. There is a built in antenna, but with no external input. Although, an external antenna can easilly be clipped on. A single 2.5 inch speaker is built in on the front of the unit and is loud enough for personal use or in a small group. It's got an earphone jack. You can plug in stereo head phones and both left and right sides play, but it's not in stereo. There are two white LEDs built into a reflector for use as a flashlight. It's rather dim by today's standards, but usable. The flashing red LED is too weak for use as a beacon during an emergency. Who will pay any attention to that? And that siren is loud enough to annoy the guy next to you, but not loud enough as an siren. On the back of the unit are several jacks. One for earphone. A second one to accept 5VDC (neg tip). The third jack outputs power to charge a cell phone from the hand crank generator. Included with the unit is a short cable for charging cell phones that plugs into the back. At the other end of this cable is a jack that accepts several adapters that come with the unit. These generic adapters are supposed to fit on common cell phones. The manual does not tell you which adapter fits on what phone, you'll have to guess. If you're handy, you can cut up the cell phone cable and wire it to your cell phone charger cable that came with your phone. Grundig Eton has been very creative in powering the FR250. Energy can come from an external 5VDC such as a wall adapter. It can come from three 'AA' cells. Or it can come from a Ni-MH battery pack. An AC adapter, not included with unit, with an output of 5VDC can be used to power the unit as well as charge the removable battery pack. It does not charge the three 'AA' cells of course, but that can be fixed if you're handy. Of course, this limitation is a safty feature. The original 3.6 volt battery pack has a capacity of 600mAh. At the recomended crank rate of two turns per second, it would take about four hours to charge the battery pack. An in circuit test shows the battery pack charging at about 4VDC at about 100mA when cranking at the recomended rate. I've modified the FR250 to be able to recharge the battery of three 'AA' cells. I re-wired connections to the battery holders. Originally, the dynamo charges the battery pack. The 'AA' battery also powers the unit. I took out the positive (red) connection going from the circuit board to the 'AA' battery holder. Both batteries share the same negative circuit ground. The battery pack has its own positive connection to the circuit board. I placed a jumper on that positive connection to the 'AA' battery's positive connection. 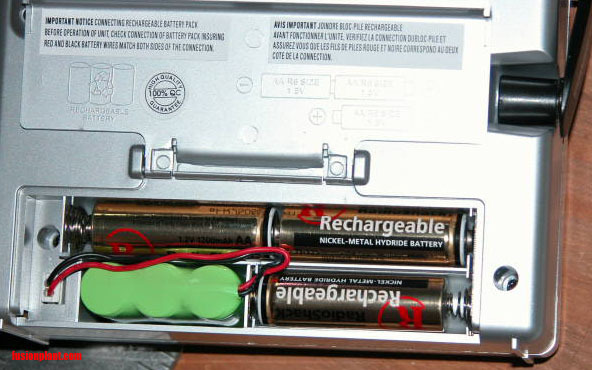 Now both batteries are in parallel so that when the hand crank is turned, both batteries are charged at the same time. Which also means that whan an external 5VDC source is plugged into the back of the unit to charge the battery pack, the 'AA' battery is also charged. This also means that both batteries are discharged by the FR250 radio at the same time. With storage technology imporving, 'AA' cells now have capacities of over 2000mAh. You probably won't have the energy to fully charge 'AA' cells at such capacity using the hand crank. An in circuit test indicates that the hand crank charges the batteries at about 0 to 8 volts or more and with about 0 to 500mA or more. These ratings depend on your energy level. Power is proportional to the speed at which you turn the crank. The charging circuit is unregulated. I'm not sure if a charging circuit exists. 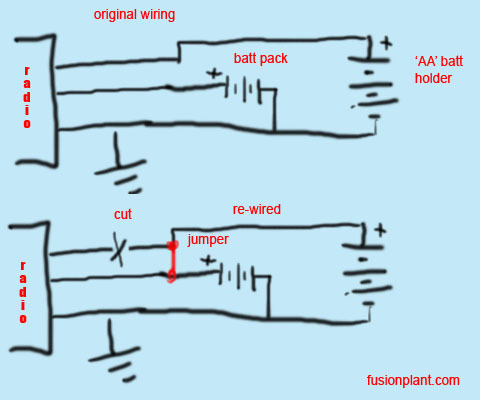 That is besides a simple diode or a four diode bridge rectifier. Dec. 8, 2005 -- I added a home-made solar panel. 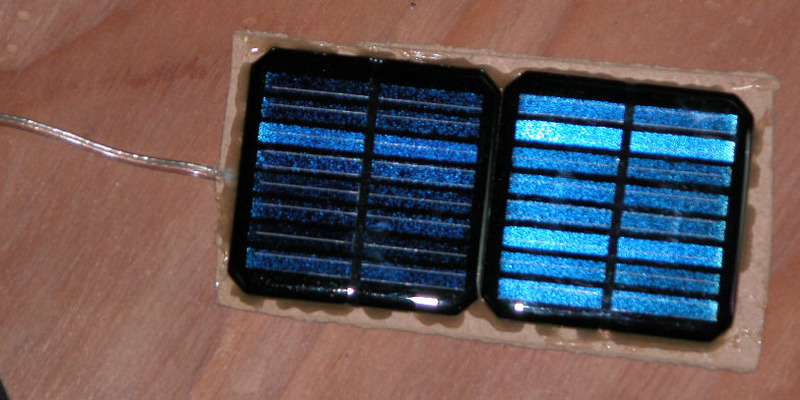 It is made of two solar panels wired together. 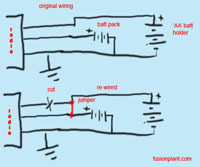 Each has an open circuit voltage of 4 volts and a short circuit current of 45mA. 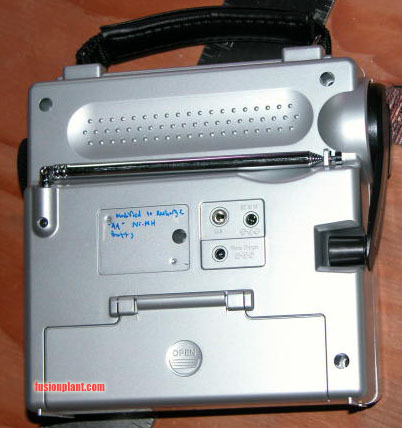 A single panel connected to the back of the FR250 unit will not charge the batteries. This is why I used two. Together, they charge the batteries at about 39mA in full sun. I'm using the solar panel in my car so I connected a long pair of wires to it. At the other end are two tinned exposed wires. Last month, I took one of the cell phone charger adapters apart and wired it to two alligator clips. This way I can charge my cell phone which none of the adapters seem to fit. Also, I wired a RJ11 (telephone jack) to the battery compartment so that I can power other devices. I took out the small battery pack and used three 'AA' cells instead. I cut the two wires and connected them to the RJ11 at one end. And at the other end is the orininal connecter to the back of the unit. Hope that makes sense.